My background is in Creative Coaching and I am a Certified Image Consultant with AICI. I am also the Creative Director for L’Amour Chic. I studied Luxury and Fashion Management in Paris, France, so I have first hand experience with some of the best brands in the world. Having international experience allows me to have a unique eye and see styles that others may not normally wear and place them in the boutique. With that, we offer private image consulting services within the boutique, which includes personal shopping and styles assessments. I can confidently find something for anyone. What inspired you to start L’Amour Chic Boutique? The idea of L’Amour Chic Boutique came about when my mother and I decided we wanted to offer clothing in South Atlanta, specifically Fayetteville. We wanted to place the boutique in a place where clients could come and get the full experience, including hair, nails, massage, waxing, and facials/makeup. So, L’Amour Chic Suites of Fayetteville was created. L’Amour Chic Boutique completes the experience. Take us through a day in your life as a boutique owner. I get up. Check emails. Head to the boutique. Go over merchandising to make sure new arrivals and sale items are visible. From there, I could be doing anything. My days are never the same, especially since I have a office manager who helps with the physical boutique while I do the creative and business parts. How would you describe the “style” of your clothes/boutique? L’Amour Chic offers unique styles that are comfy and fashionable. Some of our pieces come directly from runways. All of the styles we choose are for women who want to flatter their shapes, look younger, or thinner, and who want to feel confident about themselves. I always tell women you can be flirty and have fun with fashion without having to compromise for price. Style is what you make it. I’m a new mom. So, being able to work in a place that doesn’t control my hours is perfect. I’m also a creative and I need variety. I get to network, attend exclusive shows and events, travel, create marketing material, be the visual merchandiser, as well as select clothing from all over the world, plan and execute photo shoots, hire models, hair stylists, and makeup artists, and constantly create a new day. No day is the same. How does fashion impact a woman’s self confidence? Fashion is amazing. Fashion allows each individual to fully express themselves in their own unique form. You never have to worry about looking like someone else, because within fashion, options are unlimited. I have had women say to me all the time, “Wow! I would have never thought to try that on!” Especially, when I’m working with youth girls who have never worn professional clothing for interviews and jobs. They put on these clothes and transform into young women who can conquer anything. Fashion can literally help you craft an image that, with the right skills attached, can get you into any door. That’s how you build self-confidence. What are some “must have” trends for this holiday season? Some of my favorite styles we will be presenting this Fall/Winter 2017 are our holiday pieces include gorgeous silver pieces and silver touches, like our Cinderella jumpsuit (pictured above), and Lipstick Red like our Double Breasted Peacoat. We also love denim, because you can literally pair it with anything! Our favorites include our McGuire jeans, denim leggings, and of course, our Denim Fleece Hoodie. What should a shopper do to prepare for Black Friday? If you’re shopping online, make sure you have your code ready and you’re early. All of our pieces are unique and will sell out quickly! If you want to get ahead of the online pack, but you’re in the Atlanta area and want to come to the boutique, you can order and pay during the online sale and pickup your items directly from the store. Do you have any Black Friday Deals going on? Best gift recommendation for your BFF? Mom? We have a wide variety of cute tees for anyone. They can be paired with blazers or more casual jackets. Best thing, they’re 2 for $20! Match styles but different colors with your BFF or Mom. We also have unique jewelry pieces online and in store for the pickiest of shoppers. They add subtle signature style to any outfit. Do you have any tips for Black Friday shoppers? What advice can you give to any young woman who want to start their own fashion boutique? Make a business plan and execute. You can start by creating a shop online. Choose styles that relate with your own individual brand. Don’t be so focused on trends. Choose some styles you may not see everywhere and always investigate quality. Be patient and consistent. If you need help, never be afraid to ask. Such a great interview! I will have to check out her boutique! The boutique is so cute! Love her things! Great interview! 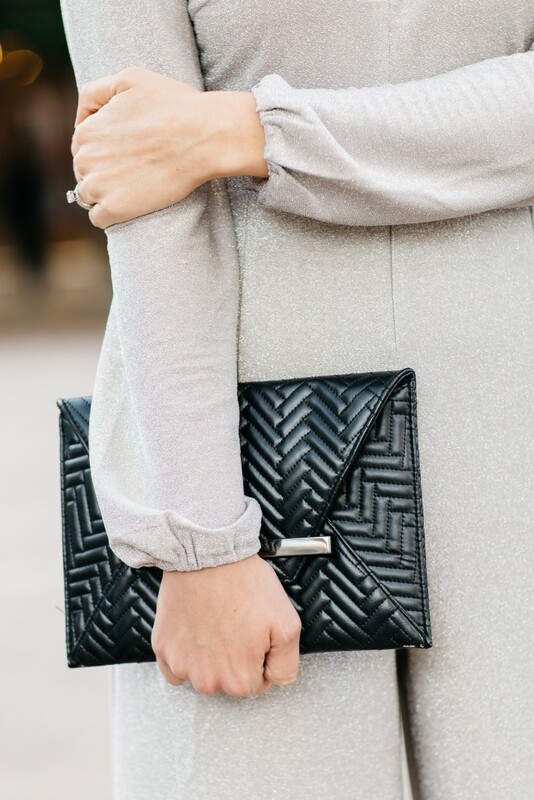 This jumpsuit and clutch are so pretty! This is the most gorgeous jumpsuit! I want it! Thanks for sharing such a great interview! You are stunning!! Such a gorgeous jumpsuit! 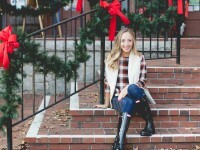 This is a gorgeous jumpsuit and great tips for preparing for Black Friday! You look great! Love this interview too! How stunning are you in this jumpsuit?! I’m beyond obsessed! you had me at jumpsuit!!! This jumpsuit is stunning! Great interview! Totally swooning over this look! Loved the interview!